This photograph released by Indian Space Research Organization shows its polar satellite launch vehicle lifting off from a launch pad at the Satish Dhawan Space Centre in Sriharikota, India, Feb.15, 2017. An Indian rocket blasted off Wednesday morning from Sriharikota in eastern India putting a record 104 satellites into space in a single launch, surpassing Russia’s previous feat of launching 37 satellites one year ago, according to India’s space agency. The launch also marked a milestone in the country’s efforts to emerge as a serious contender in the multi-billion dollar global commercial space industry by slashing costs. Besides a 714 kilogram earth observation satellite, the others were mostly nano satellites — those weighing up to 10 kilograms. A majority of these small satellites came from customers in the United States, others from countries such as Kazakhstan, the Netherlands, Switzerland and the United Arab Emirates. 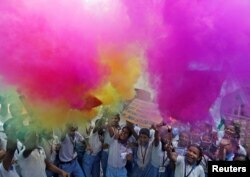 School children light fireworks as they celebrate India’s Polar Satellite Launch Vehicle's (PSLV-C37) take off which carried 104 satellites in a single mission, at a school in Ahmedabad, India, Feb. 15, 2017. The nationally televised launch showed scientists applauding successive stages in the mission control room. India’s space program has focused heavily on low-cost access to space. The ability to put a larger number of satellites in space in a single launch brings down the cost significantly, which could help the country grab a larger slice of the commercial launch market, analysts say. FILE - India's Polar Satellite Launch Vehicle (PSLV-C30) lifts off from the Satish Dhawan Space Centre in Sriharikota, South India, Sept. 28, 2015. 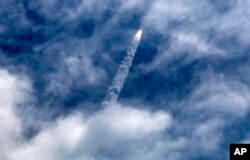 PSLV-C30 mission included the launching of India's space observatory satellite. The growing demand for more high-tech communication by countries, as well as by private telephone, Internet and other companies, has hugely boosted the demand for such launches. Last year, India launched 75 satellites for foreign customers. India increased the budget for its space program this year and allocated resources for a potential second mission to Mars and its first to Venus in the coming years. India’s ambitious space program got international attention after a successful mission to Mars in 2014, whose price tag of $74 million, compared to $670 million outlay of NASA’s Mars mission a few months later, was hailed as an indication that its frugal space program has achieved technological prowess. FILE - Indian Space Research Organisation scientists and officials pose for photos as they celebrate the success of Mars Orbiter Mission at their Telemetry, Tracking and Command Network complex in Bangalore, India, Sept. 24, 2014. ISRO plans to send a second mission to study the surface of the Moon next year and is also eyeing a second mission to Mars and its first to Venus in the years to come. Many see India’s foray into interplanetary missions as part of its ambitions to be seen as one of the world’s leading countries. “One of the factors is also Asian nationalism and the competition. There are also lot of things being planned to also show that India is an advanced technology power in this regard,” said Rajagoplanan. While India has developed the capability of putting smaller satellites in space, it still has some way to go before it can launch heavier ones, according to scientists.